Sometimes in our hunt for the next perfect car, we end up looking at a variety of vehicles that don’t really compare with one another. That’s perfectly okay, but figuring out which one to buy can be tough because each car speaks to a different set of priorities. Welcome to a Ask Automatch! Where you get to ask me your burning car buying questions. Got a scenario or a situation and you aren’t sure what to do? Send an email to Tom.McParland@jalopnik.com and I’ll try to help you out. I’ve been shopping for an all-wheel-drive luxury car that is fun to drive, but also provides a low cost of ownership. I would like something exciting with little bit of room and easy to sell it for good value if I do get bored. After driving a bunch of different cars I got it down to a certified pre-owned 2014 Infiniti Q50 Premium with tech package with around 16,000 miles for $32,555 including tax and fees or a brand new 2016 Mazda CX-5 Grand Touring with a sale price of $30,771 out the door and zero percent financing. I really like everything about Q50, but it seems like it would cost me a lot more than a new Mazda. I’m not really sure what to do. There are a few ways to think about this. The first way to look at it is in terms of value for your dollar. When comparing the total out the door costs, the Q50 isn’t dramatically more expensive at about $1,800 more, which works out to around $33 a month over 60 months at 3 percent APR. The original price on that Q50 is probably in the ballpark of about $46,000, while the CX-5 Grand Touring is about $33,000 grand. So you can get a $46,000 Infiniti for about $30,000 (before taxes and fees) or a $33,000 Mazda for $29,000 (before taxes and fees). Seems to me the value is in the Infiniti. The Mazda is probably the “safer” bet in terms of maintenance, insurance, and fuel costs, but the Infiniti is arguably the more enjoyable drive since it has more 300 horsepower and a slew of luxury features. Even though you are starting fresh with the Mazda warranty, keep in mind that Infiniti CPO coverage is six years and unlimited miles from original date of service. According to the CarFax report it looks like that Q50 wasn’t sold until January of 2014, so you would be covered until Jan of 2020. While Mazda’s powertrain warranty is five years or 60,000 miles, which would keep you covered until November of 2021, you don’t normally have to worry about issues with major components like the engine and drivetrain. Mazda’s bumper to bumper is three years or 36,000 miles, which means you are only covered for the little stuff until Nov of 2019. Even though the Infiniti is used and has some miles on the clock, it’s actually giving you a better overall warranty. As for your depreciation concern, that is a bit of a tossup. Typically, if you buy a used car after someone else has already taken the initial drop your cost of ownership will be a bit lower than if you buy a new car. 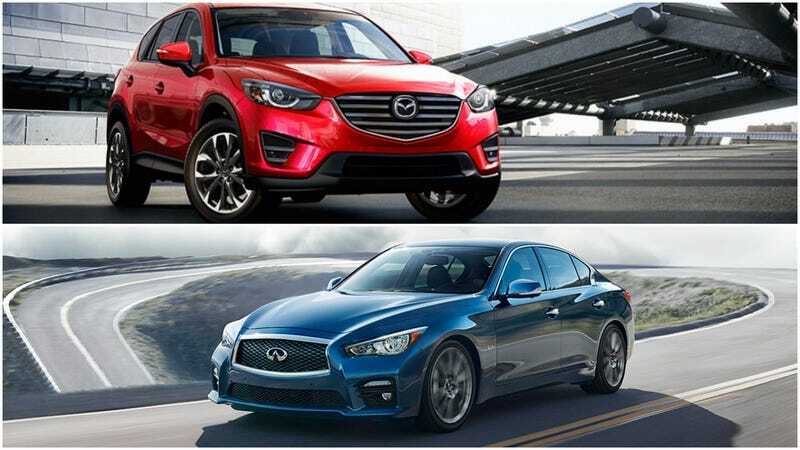 However, mainstream cars that have a good reputation in the marketplace, such as Mazda, hold their value pretty well. At the end of the day it’s all going to come down to your priorities, and honestly both are very good cars so there really is no wrong answer here. Do you want the taller ride height, better fuel economy, and new car smell of the Mazda? Or do you want the extra power, luxury features, and used car value of the Infiniti? You are probably going to have to go with your gut on this one, but personally, I would take the Q50. Should I Buy A Certified Pre-Owned Luxury Car Or Lease A New One? What Is The Best $30,000 Compact Crossover That Is Still Fun To Drive?